After the Second Seminole War, the federal government passed the Armed Occupation Act of 1842 to encourage settlement of the state of Florida. This brought settlers to the Crystal River area to homestead. After the Civil War, Crystal River continued to grow, spurred by the citrus and turpentine industries. In 1888, the railroad was extended to Crystal River, making transportation of goods and citrus to northern towns much more profitable. The railroad also made it much easier for tourists to come south, and sport fishing became a major attraction for weathy northerners. One of the major features of the area that attracted early settlers were the many fresh water springs in and around the Crystal River area that fed into King's Bay. The cluster of about 50 springs are estimated to produce about 64 million gallons of water per day. And, in addition to people, the springs attract manatees and other wildlife - especially in the winter - who are attracted to the constant 72 degree termperature of the water. 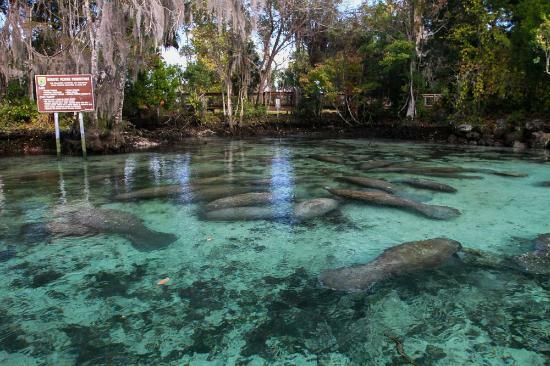 One of the best places to view the manatees is at Three Sisters Spring, where kayak access is limited at times due to the high number of manatees near the spring. A number of public access areas make exploring Kings Bay, the Crystal River, and the springs fairly easy - either on foot, by kayak, or by motorboat. Crystal River Preserve State Park provides a kayak launch and public boat ramp. The Crystal River Archaeological State Park provides a first hand look at how early prehistoric civilizations existed in the area. And following the Fort Island Trail all the way to the west brings you to boat launch facilities and a great view of the Gulf of Mexico.